L’Auberge will unveil its new $4 million smoking and gaming terrace at noon tomorrow. The Riverbend Terrace—a smoker-friendly outdoor gaming patio adjacent to the casino’s main floor—features more than 120 slot machines and video poker. The patio, which overlooks the Mississippi River, also includes multiple 65-inch TV screens, air filtration systems, six industrial-size ceiling fans and gas-fired radiant heaters. “Our goal with this latest reinvestment in our property is to provide a comfortable environment for both our non-smoking and smoking guests,” says L’Auberge General Manager Kim Ginn in a prepared statement. Construction on the 3,700-square-foot patio began in December, six months after a state law went into effect banning smoking in bars and casinos. Consequently, the terrace is covered, but completely open on the Mississippi River-facing side. The terrace is among several efforts underway to attract more patrons to Baton Rouge’s three casinos, which have consistently seen declining revenues due changing consumer habits and the smoking ban that went into effect last May. In 2018, collective revenues at L’Auberge, Hollywood Casino and the Belle of Baton Rouge plunged 15% to some $256 million, a steep decline from the more than $300 million they brought in the year previous. L’Auberge, though the best-performing of the three, last year saw a 12.2% decrease in revenues from the year before, propelling the casino’s new parent company Penn National Gaming to move forward with plans for a smoking terrace. 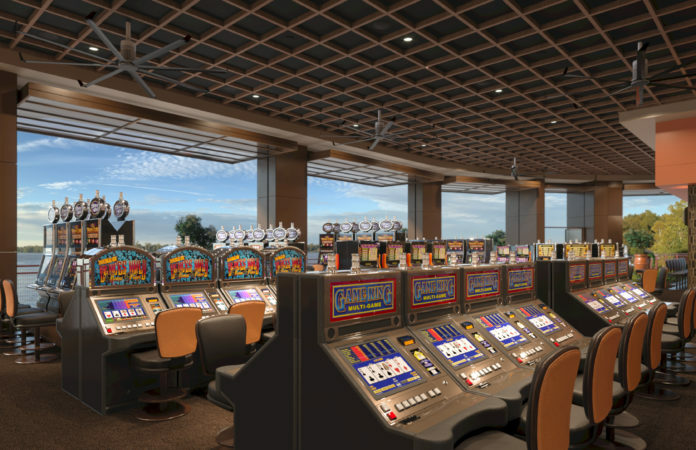 Meanwhile, Hollywood Casino devoted a covered area in one of its upper decks to smoking, while the Belle of Baton Rouge is also considering casino upgrades to attract guests.